Cusco Pillar Side Bars - RPM - Racing Performance Motorsport - Your source for performance parts and accessories. 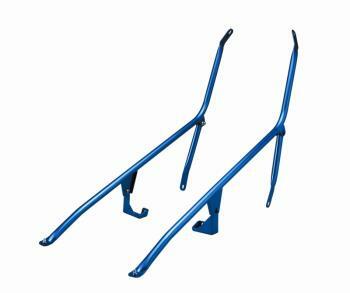 These bars are designed to add rigidity to the b-pillar area of the car on 2 door models. Because the 2 door models have a much larger opening for the door than a 4 door model, it needs more bracing to keep unwanted flex away. Painted classic Cusco blue, the bars come with all the hardware for installation. Some drilling is required for installation.